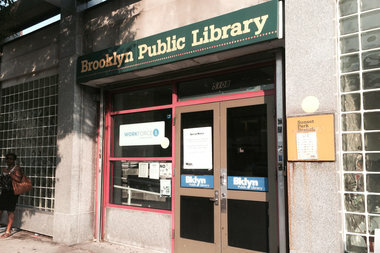 The Sunset Park branch of Brooklyn Public Library located at Fourth Avenue and 51st Street. SUNSET PARK — The Brooklyn Public Library is considering a redevelopment plan for its Sunset Park branch that would create a larger library and add 54 affordable apartments to the building — with units starting a low as $525 per month, officials announced last week. The one-story building would be redeveloped to include eight stories featuring studios, one-, two- and three-bedroom apartments, all below market rate, under the plan being floated by the nonprofit Fifth Avenue Committee, a Brooklyn nonprofit that wants to redevelop the branch. The building will have a total of 55 units, including a superintendent's apartment. Forty-five of the apartments would be priced at “less than 1/2 the current market rents in Sunset Park,” with studios renting from $525 to $750 per month and three-bedroom apartments from $796 to $1,249 per month, according to an emailed announcement from the committee. The other nine apartments would be geared toward moderate-income households, with studios priced at $1,000 per month and three-bedrooms at $1,595. The plan is still in its preliminary stages but could up the library’s square footage from 12,000 to 17,000 “to meet the increased demand for both library and community activities,” the announcement said. The project, which is estimated to cost roughly $25 million, would represent a partnership between the Fifth Avenue Committee and BPL, according to Jay Marcus, the committee's director of housing development. Under the proposal, the city would own the library space and the Fifth Avenue Committee would own the rest of the building, Marcus said. The Brooklyn Public Library declined to comment on details of the project but told DNAinfo New York in October that "[o]f paramount interest to us is the potential opportunity to expand this very crowded branch." Officials from the Fifth Avenue Committee and BPL will discuss the plan with locals and Community Board 7 Monday at 6:30 p.m. at the Sunset Park Library, located at 5108 Fourth Ave. Residents of the Community Board 7 area, which includes Sunset Park, Greenwood Heights, Windsor Terrace, East Windsor Terrace and South Park Slope, would receive preference for at least half the apartments under the plan. “This proposal would meet an important need for expanding the public library and creating decent and safe housing affordable to local residents,” the announcement said. The Fifth Avenue Committee will seek support from the community before continuing with the plan, Marcus said. The group is hoping to apply for state tax credits to fund the project by early December. If approved, it will begin the city's Uniform Land Use Review Procedure in April and ideally start demolishing the building in 2016, Marcus said. Construction will take roughly two years, and an alternative library location will be sought before that time, he added. The library system is in need of $300 million in capital funding as of 2013, according to a September report from the Center for an Urban Future. BPL recieved roughly $20.9 million in capital funds in the 2014 fiscal year, the report said. In September, the BPL announced a similar plan for its Brooklyn Heights branch, which has been tenatively approved to be sold for $52 million to a private developer and will be redeveloped into condos and a new ground-floor library, as well as 114 off-site affordable housing units. Editor's Note: An earlier version of the story misstated the year in which construction would begin on the project. It is 2016, not 2015. The article also incorrectly noted the number of affordable housing units proposed for the building. It is 54, not 55.